I mean that title both in a literal way and a pun. After busting our butts to get the lap siding wrapped up on the back and side, we’ve taken it easy. Partially because the heat limits what we can get done. Also to spend time with visiting family. But that hasn’t completely stopped us from checking a few things off our list. Early on Sunday morning, to beat the afternoon heat, I climbed up on the scaffolding to edge around the two windows. With the third coat done, the scaffolding finally came down! And Ben hung the exterior lights, hence the punny title. Looks so much better and updated than the blue before. Now to measure and order the lower steel. Two lights also flank the back door. Our preference is down directional lighting, to decrease light pollution. 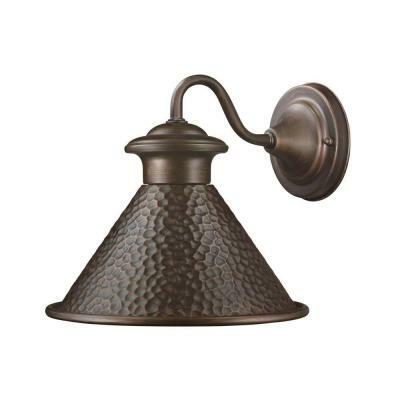 These Hampton Bay Essen outdoor sconces are super simple and exactly what we had in mind. A tiny touch of dark jewelry for the house. In other exciting news, the last five windows and doors for the front of the house came in last week. Weather, please cool off just a little so we can get started with those big changes. From a mother to a mother (nature), please. With hot temps outside, I focused some of my energy inside. Particularly, the four-month neglected replaced wall in the dining room. I’m finishing up wet sanding the joints to get ready to texture. Unfortunately, to match the rest of the walls in the room, we have to spray on and knock down texture on this wall. Then we can add trim and paint the town. And add a set of curtains to that bare window, to match the other two in the room. Your house is coming along so nicely. It’s going to be gorgeous when it’s done. Well, we’re trying to match this wall to the other ones in the room. So, we’re kind of stuck texturing the walls. I’d prefer smooth walls, but everyone’s different. I plan to share more about our process once we finish it up.